We went to the Lynden FFA Corn Maze yesterday. It is amazing how long we have lived here and never gone, but we had such a good time that we have decided it is now a new tradition. We invited Holly and her kids to join us, and the weather was perfect. Sunny, beautiful, about 70 degrees, we couldn't ask for anything better. 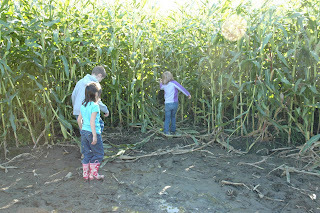 The older kids had a blast exploring the corn field, Emma kept wanting to pick the corn and bring it home for dinner. The twins, however, had some trouble with the mud. Ben, as usual, was gung-ho and just plowed through it, thinking that it was the coolest thing ever. We had a hard time keeping him out of it! Grant is so funny, he does not want to get dirty, he kept saying "owie" every time he touched dirt. 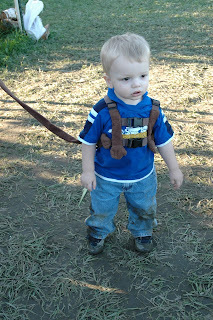 We did get to try out their new backpack leashes which were perfect! I never thought I'd be the type of parent to put my kids on a leash, but these twins have not given me a choice. 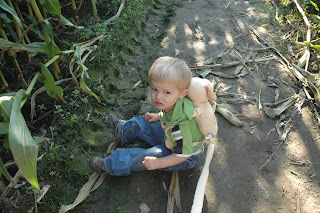 It was so nice to wander the corn maze relaxed, knowing the boys could not run away and get lost. We had decided earlier that after the maze, we would go out to dinner as a family. Me being a city girl, did not think about how muddy the kids would be after the maze, but we ran home and changed clothes before going to Chihuahua's, the greatest Mexican Restaurant in all the world. The last time we tried to go out to eat was about eight months ago. We had gone to IHOP, thinking that it was a loud, kid-filled place that our munchkins could not disrupt. The day that we went must have been an IHOP record, since we had the only kids in the entire restaurant. It was filled with quiet people, and they didn't even have any background music to block out the noise. It was a struggle to keep the boys quiet, we were being stared at and actually had people staring and shaking their heads at me. By the time our food came, all semblance of a normal family had broken and the boys decided to have a scream-at-the-top-of-your-lungs-and-throw-food-at-each-other contest. I got two bites of my dinner in and left to take the boys out to the car, Marty and Emma stayed behind and had a nice Daddy/Daughter dinner. I waited in the car with the screaming boys and cried. Needless to say, we were a little weary about trying to go out to eat again, but wanted to try it. We chose Chihuahuas since Mexican food is notoriously fast service and relatively noisy atmosphere, so we thought it would be a good attempt. Also, I was craving Rice and Beans. Win Win! I must say, it went better than I ever imagined. Not a single fork, plate, or cup hit the floor, and the only food that went down there was accidentally dropped, not thrown for fun. The food was excellent, the service was fast and great, and the best part was at the end of the meal when Emma somehow accidentally spilled her entire glass of ice water down Marty's side. We still can't figure out how that one happened, but I sure got a good laugh! We successfully wore the kids out, Ben and Emma slept till 8:30 this morning, and Grant till 10. We will definitely be going again next year! It's a new tradition to add to the many other traditions. Next year I'll remind you to put boots on the kids. Cute pics of the kids. I think people who stare when toddlers are being well. . . toddlers need to just deal. You can always wish twins on them;o) It wouldn't be a very fun story if they were stepford kids would it? YOur boys and Emma are darling noise or no noise. Kolette dosen't have a mute button period! It drives me nuts! Yep, I am getting old!